Move over Mr. Potato Head. There’s a tastier tuber taking over this town. Sweet potatoes are back with a sizzle. Whether fried or flambé they are rustling russets and leaving them spinning on the cutting board. These beautiful on the inside, rustic on the outside potatoes are hallowed to me. They were the very first food my mom feed me when I was 6 months old. Mom said she would wrap a sweet potato in alumni foil and bake it in the oven until it was soft. Then she said she would scoop out the center, mix it with a little Pet Evaporated Milk and that was my din din. She said I loved it. I am not sure if feeding me a sweet potato as my first food was a southern tradition, but it certainly was a family tradition. It was my mom’s first food, her mom’s first food and so on. When I had children, it was their first food too. Mom also said sweet potatoes were back then as they are today the “perfect first food.” I never found a reason to quarrel her southern logic; after all she’s my mom. While I can’t cite any scientific evidence to support my mom’s long held belief, I can say that sweet potatoes are rich in Vitamin A (about 19217 IUs for a medium sized portion) compared to russet potatoes (3 IUs). And Vitamin A contributes to good vision, a healthy immune system, and cell growth. Inevitably and perhaps by southern design I grew up with a penchant for sweet potatoes. When sweet potato fries – which are now as ubiquitous as their russet comrades – emerged as the new haute thing in the foodie-a-sphere, I was in epicurean bliss. From the freezer section of your local grocery store to TGI Friday’s, they were (and still are) everywhere they can be and I’ve eaten them with more regularity than I will admit. 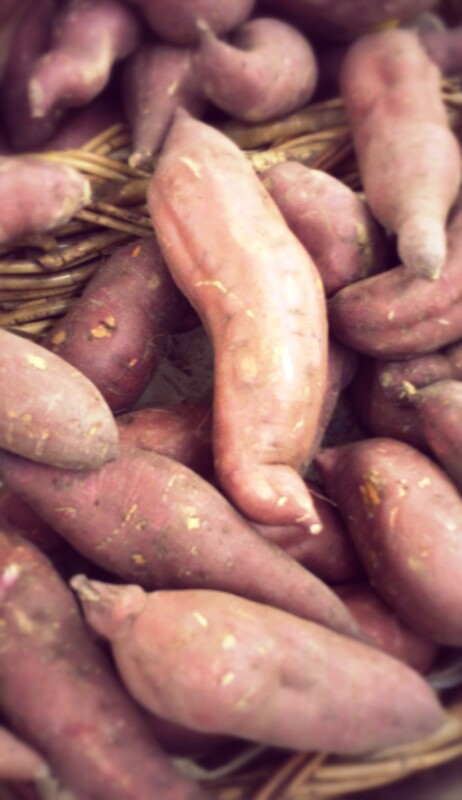 Sure there’s always going to be chatter and vigorous debate about what an actual sweet potato is versus a yam. I won’t get into that here. But basically, sweet potatoes are large orange, starchy and sweet-tasting root vegetables. 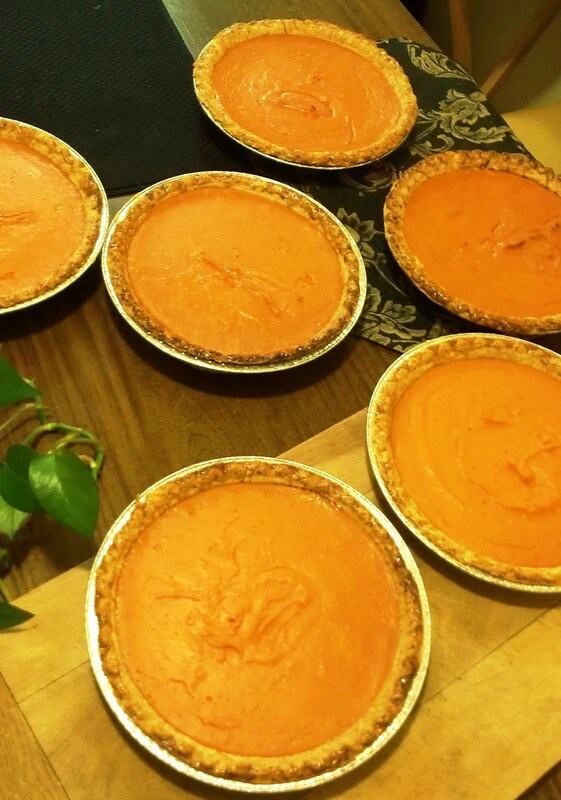 These tuberous delights are what I use to make my “tator pies” each year around the holidays. But why stop at fries and pies? 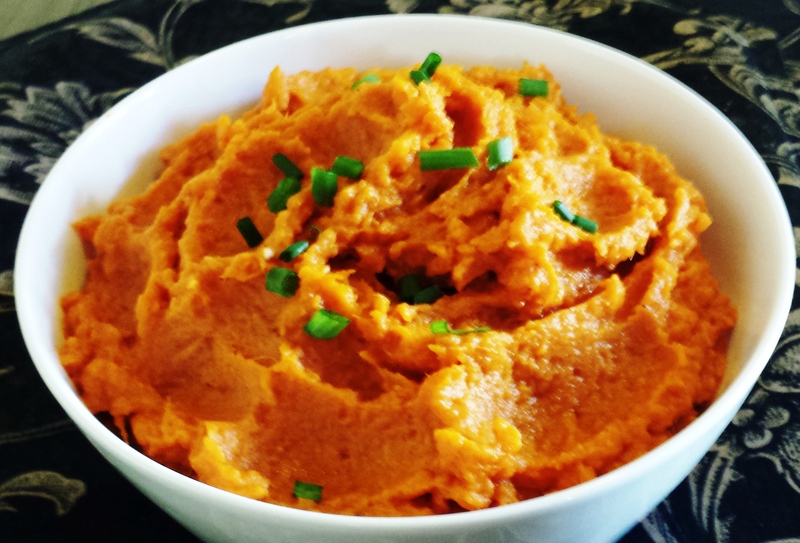 Sweet potatoes are the tubers of endless possibilities because they can be transformed into a sweet treat or savory and sassy entrée like my recipe for Orange is the New Mashed Chipotle Sweet Potatoes which are a show stopping alternative to mashed spuds. It’s a hearty, delicious recipe and it has a bit of a kick. The only thing missing is crumbled bacon, but you can add that. Peel and cut sweet potatoes. Place in Dutch oven pan and fill with water until completely covered. Add 1 teaspoon salt to water and boil for about 30 minutes until fork tender. Drain sweet potatoes in colander and return to Dutch oven. Add butter, lemon juice, spice rub and Adobo Sauce. Mix well. With a potato masher, mash potatoes to desired consistency (smooth or chunky). Stir in evaporated milk. Over medium heat, cook 2 minutes or until thoroughly heated, stirring constantly. This entry was posted in Foodies and tagged Adobo, Adobo sauce, caviar, Chipotle, chives, collard greens, Comfort Food, cooking, epicurean, evaporated milk, flambe, immune system, lemon juice, milk, Mr. Potato Head, Pet Milk, potato masher, potatoes, Red Velvet, Red Velvet Gourmet Spice Rub and Seasoning, root vegetables, russet potatoes, sizzle, Southern, spice, sweet potato pie, sweet potatoes, TGI Friday's, tuber, Vitamin A, yams. Bookmark the permalink.